As the southern Alberta region continues to recover from overland flooding, so too have agricultural producers who have seen delays in their planting season from Old Man Winter who seems to have finally relented. Planting of the potato crop has been delayed, but if current weather patterns hold up, the delays should not be overly worrisome. Dealing with moisture from all over the region, there may be some farmers who have early field run contracts who may or may not have to find different fields. Once the potato crop is seeded, it will be at the mercy of Mother Nature like any other crop where hopefully warmer temperatures continue. Hochstein looked over the seeding dates over the last 11 years, the latest average planting date was in 2010 and it was May 10. Last year, the average planting date was April 20. “It’s all perspective,” said Hochstein. There have been delays for the start of the local sugar beet crop as well. 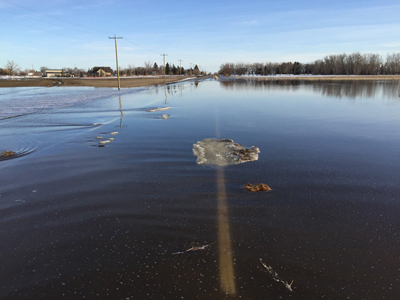 With the Municipal District of Taber still under a local state of emergency for overland flooding, farmers have had a rough start to their spring. While the warmer weather over the past several days has helped dry some areas out, some are still under large amounts of water. Rural roads have also been closed throughout the region because of damage to infrastructure caused by the water. “Some places are looking better than what they have been but there is lots of standing water, lots of large slews out here. Some have shrunk when the frost went out so they’ve gone down but there its still lots of water. The roads are extremely soft, there’s lots of damage to roads and to irrigation ditches,” said Lynn Jacobson, president of the Alberta Federation of Agriculture. The rough condition of the roads around the M.D. is a big factor that can often be overlooked but right now many roads could not handle the load of trucks needed for farming. With no set date for when trucks will be back on rural roads, Jacobson is hopeful that they will be ready to go in the near future. “Right now you couldn’t get a truck down our roads that’s for sure. They are soft, washouts on them so trucking right now is anybody’s guess but I’d say probably another week and a half or two weeks before. That will based on where you are and what road’s actually look like,” he said. In Jacobson’s area (Enchant), the flooding is still a major issue which will further delay the ag season.